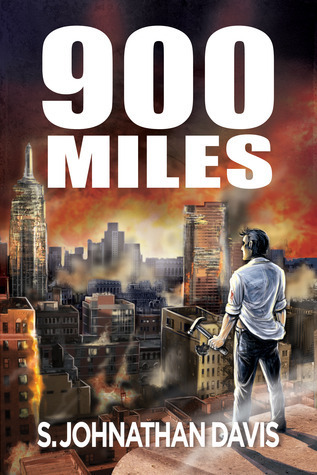 For this week's Zurvival Saturday I will be reviewing 900 Miles by S. Johnathan Davis. John is a killer, but that wasn't his day job before the Apocalypse. Teaming up with an ex-army pilot named Kyle, they escape New York only to stumble across a man who says that he has the key to a rumored underground stronghold called Avalon..... Will they find safety? Will they make it to John's wife before it’s too late? I received this book to review from the Author. All opinions are my own and I was not compensated in any way for providing them. 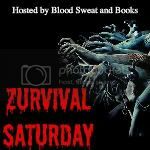 To say John is having a bad day would be an understatement, trapped in one of the world's largest cities at the start of the zombie apocalypse John must make it out of the city alive and home to his pregnant wife located several hundred miles away. Unfortunately for John with worldwide communication shady at best and transportation at a standstill this proves to be an ever increasingly difficult task. Now with the zombie hordes growing by the day and all hell breaking loose will John ever see his wife again? Well sorry no spoilers here, you're just going to have to read for yourself and find out. When I reached the last page of 900 Miles I knew I had just read something pretty special. I was glued to my Kindle reading this book, I flipped each page with hesitation not knowing what horrors or joys would befall these characters with the flick of a finger. I came to care for John and Kyle as they made their way out of the city and across the undead landscape. I truly hope this is a series because I want to see more from these two. Plus that ending just screams sequel, I'd be so disappointed if it truly ended like that leaving us readers to imagine what went down. One thing I loved about 900 Miles was the world building. Not only does the Author provide a satisfying amount of backstory before the undead even show up, but, he also shows quite a bit concerning all the characters pasts as the story unfolds. It was really well done. Another thing I enjoyed was the violence. It was gory and primal when it needed to be but not an over the top splatter fest. This book had a heart and the Author made sure that and not the undead carnage is what readers take away from it. In the end, I really have little to no complaints regarding 900 Miles. This book was well written with strong protagonists and an enjoyable overall story arc. Like I said above, I hope this isn't the end as I'd really love to see more from these characters. I will be rating 900 Miles by S. Johnathan Davis ★★★★★. Have you read this book? If so, What did you think? Do you prefer slow or fast Zombies? This sounds like a book I could read and review and re-read just to get to the hidden depths of it. Your review has made me want to read it, which I hopefully will do soon enough. Thanks! It really is worth the read.